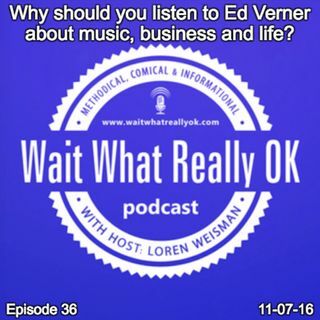 Why should you listen to Ed Verner about music, business and life? Wait What Really OK Podcast Episode 36 hosted by Brand Precision Marketing Strategist and Counselor, Loren Weisman features Ed Verner this week. In a world where people seem to be overnight instant experts that have all the answers and yet all of those answers tend to be the wrong, guys like Ed Verner stand out in a big way. While Ed is neither a life coach or consultant, his wide array of experiences, successes ... See More and failures have given his the knowledge that makes the difference when people choose to listen to him. As an investor, a businessman, a musician, and much more, Ed has lived many lives and worn many hats. He sets the example for what people need to look for in a coach, a mentor, a consultant or a teacher by being someone that has actually been there, done that and worked across a wide array of budgets, egos and scenarios. This makes for much better information over someone fresh out of the gate, guessing or claiming broad facts that applied to a specific situation to everyone and every budget. This episode is sponsored by eSigns. Where everyone saves on signs. Anyone who uses the promo code WAITWHAT will receive 10% off their order. Visit https://esigns.com/ for more info. Why should you listen to Ed Verner about music, business and life? ep36 of the Wait What Really OK Podcast is available on iHeartRadio or here on Spreaker. Podcast Blog Supplement for Episode 36 of the Wait What Really OK Podcast with Loren Weisman. Podcast Link Supplement for Episode 36 of the Wait What Really OK Podcast with Loren Weisman. What is the best advice for a baby boomer to follow their passion? Podcast Video Supplement for Episode 36 of the Wait What Really OK Podcast with Loren Weisman. Podcast Photo Supplement for Episode 36 of the Wait What Really OK Podcast with Loren Weisman.